Though both sides in the deal say it’s too early to say much about it, scheduling is already underway for the public process required to approve plans for a 6-story assisted living care facility run by Redmond-based Aegis Living on a peculiar triangular lot at 22nd Ave East and East Madison, across from Safeway. “We are not currently far enough into the project to have more information at this time. We will be sure to forward on details as the are more concrete,” a company spokesperson told us via e-mail. Earlier this week, the Seattle Daily Journal of Commerce ran a brief saying that Aegis plans to begin construction at the site in late 2011. What CHS has learned is that the land owned by Meriwether Partners LLC will be sold to Aegis for the development pending the completion of the company’s “due diligence” on the lots and further information on the “feasibility” of the project. Part of that will likely hinge on the city’s Department of Planning and Development’s first Early Design Guidance session tentatively scheduled for January 11th. We’ll have more information on that as details firm with the Capitol Hill Design Board. If Aegis buys the three empty lots at the location, they’re looking at acquiring land worth around $3 million, the price Merriwether payed for the land in 2008 when it was acquired from the Madison Temple Church of God in Christ, across the street. 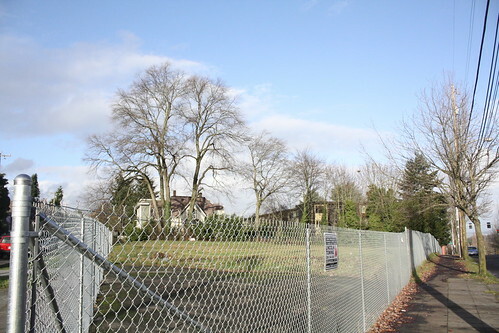 At one point, the land was owned by Chester Dorsey who operated an auto business in the area and owned a handful of parcels in the area connecting the Central District and Capitol Hill. In November 2001, a permit for a $17 million mixed-use development at the location was approved but the investors never went forward with the plan as the post-9/11 economy scuttled development deals large and small. The DJC article says “Aegis Living is hoping to start construction in late 2011”, not late January, 2011. Thanks for catch. Meant late 2011 but had January in my brain for the DPD meeting. There is *a lot* to get done before anybody thinks about digging. Good to know what’s going to (maybe) happen at that dreary site. Sketchy parked or abandoned trucks now occupy what would be the sidewalk if there was one. If there’s ground floor retail or anything resembling something for the pedestrian, I welcome it. If you’re thinking of the triangular parking area on the NE corner of 22nd & Madison: that’s actually part of the parcel across the street (the former Chester Dorsey carwash). These orphaned little triangles seem a feature of the weird angle of Madison.